Our team at poker-apps.net is always looking for new real money mobile poker clients to test. Being online in the fifth year already, we are providing our readers with in-depth reviews of all available poker apps. Our ranking of the best poker apps is constantly updated and renewed. In 2018, there will be some newcomers and surprises, too. Simply join our newsletter or check agein later and we’ll keep you updated. But now, let’s find out which mobile client has qualified for the title best poker app 2018. As you can see above, the 888 Poker App (tap here for a free download) has made it to the top of our best poker app ranking. However, the other top 10 apps are worth a closer look as well. Some of them follow by a close shave. Depending on what you are looking for, some of them might even be your personal favourite. But only one mobile poker client can be the winner in our best poker app contest. 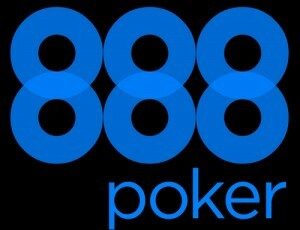 The 888 poker app offers the most complete mobile poker package. The app is extremely attractive to recreational players and comes with all important features. You can check out the real money games at 888 totally free – no deposit needed. Join 888 now or read our full review to find out how to claim the free $88/£20 welcome package. In the box below, we have summed up the aspects that made 888 grab the lead. The question how our rankings come about isn’t easy to answer in just a few sentences. During our extensive mobile poker testing sessions we examine and evaluate a lot of factors. Comfort and functionality are two of them. Does the app offer Texas Hold’em only? Or can you also play less common games like Omaha Hi/Lo or Pot Limit Poker? Can you only play cash games? Or are Sit ‘n’ Go and tournaments available on the mobile version as well? And how about a Fast Fold client, which expels boredom from mobile poker? Can you change to a four-color-deck? And what about the betting: Do you have to raise manually all the time, or are there quick buttons for common bets like 1/2 pot or pot-size? These and other functions are looked at closely when we review a poker app. Comfort feature: The Full Tilt Rush Poker App offers buttons for quicker betting. The design of the app is another factor to keep in mind. That’s the looks on the one hand and, sometimes even more important, the usability. Apps like Unibet have scored some bonus points with a more interesting table design, introducing 3D-graphics or even animations to mobile poker. On the other hand, a design insufficiency can cost you the top position in the battle for the best poker app title. The misplaced Fast-Fold button in the – apart from that – great PokerStars App is a good (or rathrt: bad) example. The flow of play is a factor that is important especially on mobile poker apps. If you are playing on a desktop PC, laptop or Mac you have a big display where you can monitor several tables at the same time. On a mobile phone it’s far more difficult to play at multiple tables. However, some apps have managed to offer multitabling poker. 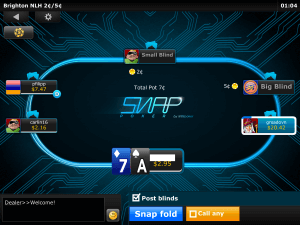 Apps like Switch Poker display up to four tables on a single tablet screen. 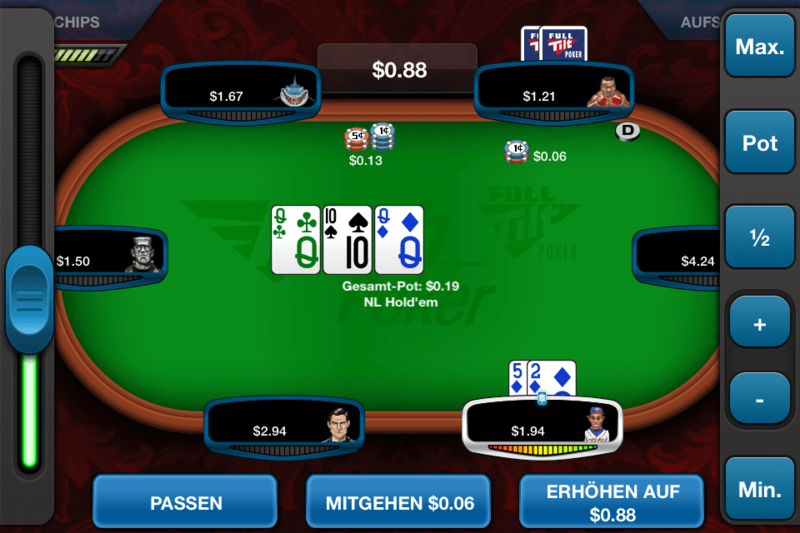 Other apps like PokerStars automatically switch to the table where your action is required. Fast Fold Poker is another possibility to let you play lots of hands on your mobile. The ideal poker app offers not only multitabling and Fast Fold but also has a big number of active real money players. Because, if the pool of players is almost empty you will still have to wait for a Fast Fold game to start. Despite having some fun while playing, mobile poker is about money, too. This is why we take a close look at the available bonus and rakeback offers as well as VIP programs. Obviously the game’s level is important, too. While advanced players are looking for some less experienced ones to play with (and win some money), the recreational player is happy not to face a shark when playing his first real money games. This is why some of the poker rooms have created newbie areas restricted to experienced players, as well as other ways to make recreational players less vulnerable. Like it or hate it – we have listed the best apps for beginners here. Last but not least, availability is a factor that influences our best poker app ranking. An app only available for Windows phone or Blackberry will most likely not make it to our ranking’s top positions. But if these platforms are supported on top of Android and iOS, this can be a bonus. The same applies to an app that is available in Apples iTunes Appstore. BTW: If you are looking for a real money poker app in Google’s Play Store, you can save your time. Google doesn’t allow real money games there. But you can still download and install an apk directly to your device. Our list of Android Poker Apps has all the download links for you. You might say: “How about the play money apps?” Well, while we are 100% committed to playing for fun, we do not like the play money apps. Most of them are a) not free to download or b) use in-app purchases or annoying ads to finance themselves. And even if you paid for them, you will never be able to win a single cent. This is why we review only the best real money poker apps. Almost all of them offer playing for fun at absolutely no cost. We suggest to download the best poker app and play for free, rather than to download a play money app you have to pay for.